Last Issues' WInner Was: aIdeen day, dFHQ To be in with a chance of winning some An Cosantóir goodies: 1) Complete the 9x9 grid so that each column, each row, and each of the nine 3x3 boxes contains the digits from 1 to 9. 2) Fill in your details. 3) Post it in by 12 Aug 2016 to: Sudoku, Connect, DFHQ, Block 5, Ceannt Bks, Curragh Camp, Co. Kildare. 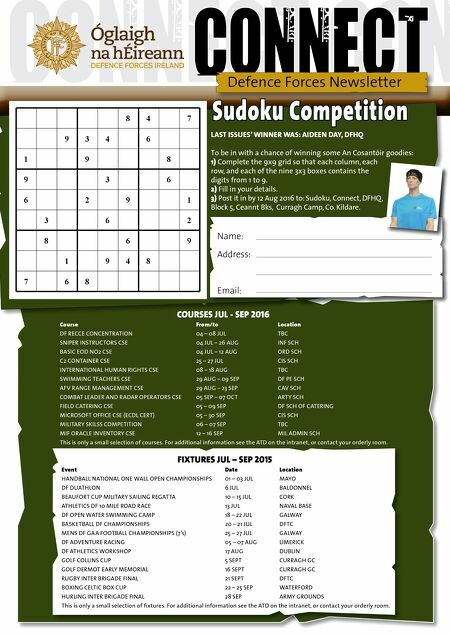 Defence Forces Newsletter Name: Address: Email: 8 4 7 9 3 4 6 1 9 8 9 3 6 6 2 9 1 3 6 2 8 6 9 1 9 4 8 7 6 8 Sudoku competition cOuRSES Jul - SEp 2016 course From/to location DF RECCE CONCENTRATION 04 – 08 JUL TBC SNIPER INSTRUCTORS CSE 04 JUL – 26 AUG INF SCH BASIC EOD NO2 CSE 04 JUL – 12 AUG ORD SCH C2 CONTAINER CSE 25 – 27 JUL CIS SCH INTERNATIONAL HUMAN RIGHTS CSE 08 – 18 AUG TBC SWIMMING TEACHERS CSE 29 AUG – 09 SEP DF PE SCH AFV RANGE MANAGEMENT CSE 29 AUG – 23 SEP CAV SCH COMBAT LEADER AND RADAR OPERATORS CSE 05 SEP – 07 OCT ARTy SCH FIELD CATERING CSE 05 – 09 SEP DF SCH OF CATERING MICROSOFT OFFICE CSE (ECDL CERT) 05 – 30 SEP CIS SCH MILITARy SKILSS COMPETITION 06 – 07 SEP TBC MIF ORACLE INVENTORy CSE 12 – 16 SEP MIL ADMIN SCH This is only a small selection of courses. For additional information see the ATD on the intranet, or contact your orderly room. FIxtuRES Jul – SEp 2015 Event Date location HANDBALL NATIONAL ONE WALL OPEN CHAMPIONSHIPS 01 – 03 JUL MAyO DF DUATHLON 6 JUL BALDONNEL BEAUFORT CUP MILITARy SAILING REGATTA 10 – 15 JUL CORK ATHLETICS DF 10 MILE ROAD RACE 13 JUL NAVAL BASE DF OPEN WATER SWIMMING CAMP 18 – 22 JUL GALWAy BASKETBALL DF CHAMPIONSHIPS 20 – 21 JUL DFTC MENS DF GAA FOOTBALL CHAMPIONSHIPS (7's) 25 – 27 JUL GALWAy DF ADVENTURE RACING 05 – 07 AUG LIMERICK DF ATHLETICS WORKSHOP 17 AUG DUBLIN GOLF COLLINS CUP 5 SEPT CURRAGH GC GOLF DERMOT EARLy MEMORIAL 16 SEPT CURRAGH GC RUGBy INTER BRIGADE FINAL 21 SEPT DFTC BOXING CELTIC BOX CUP 22 – 25 SEP WATERFORD HURLING INTER BRIGADE FINAL 28 SEP ARMy GROUNDS This is only a small selection of fixtures. For additional information see the ATD on the intranet, or contact your orderly room.